Composer and conductor German born in Hamburg on February 3, 1809 and died in Leipzig (Germany) on November 4, 1847. Grandson of the Jewish philosopher Moses Mendelssohn, Félix Mendelssohn was educated in the liberal tradition of German humanism and raised in artistic and intellectual circles. This allowed him to have tutors for the most different materials. His musical training involved her sister Fanny, Ludwig Berger (piano) and Karl Zelter (theory and composition), and also studied various stringed instruments, as well as singing and organ. In 1816 his family became to Christianity, in particular to the Lutheran religion. That same year they decided to move to Berlin and Hamburg, which had been occupied by the French leave. It was at this moment when the family adopted the surname Bartholdy, while Felix decided to keep their former surname. In 1821, when he/she was 12 years old he/she met the writer J. w. Goethe, who became fascinated with the talent of the young Mendelssohn and therefore commissioned him to put music to his poem Die erste Walpurgisnacht. At age 16 he/she wrote his octet for strings in e flat major op. 20, which was one of the first works of the romanticism written for that kind of instrumental grouping. A year later, in 1826, he/she wrote the Overture for the dream of a Midsummer night's Op. 21, based on a Shakespeare play, and decided to study at the University of Berlin. In 1829 he/she made his first trip to the United Kingdom, where Queen Victoria and the Prince Consort was admired his talent and protected him. His Scottish Symphony and Overture the Hebrides compositions owe much to this stay in Great Britain, since they were inspired by walks on foot by Scotland. In 1830 he/she began a study trip, which lasted more than two years, for several European cities, where he/she met great musicians of the era, including Chopin, Liszt, Auber, Rossini and Meyerbeer. He/She returned to Germany in 1832, and a year later directed the festival of southern Rhineland, in Düsseldorf, where also he/she was a delegate for conductor and musical Affairs. That same year he/she married Cécile Jeanrenaud with whom he/she had five children: Carl, Marie, Paul, Felix and Lili. In 1835 he/she was appointed director of the Leipzig Gewandhaus Orchestra. From his post he/she premiered works by j. S. Bach and Mendelssohn work of the great German Baroque composer rescued from oblivion and is still being interpreted today. In 1843 Mendelssohn founded and became the Manager of the Leipzig Conservatory, and occasionally also gave some classes. The King Federico de Prusia entrusted to organize the musical life of Berlin and appointed court composer. From 1841 to 1844 he/she composed stage music and sacred music. At that time was considered the most famous living composer in America and Europe, and while he/she had only three years of life, in his later years, he/she composed some of his most important works. He/She died in 1847 in Leipzig, and his remains are entombed in the cemetery of the Church of the Holy Cross in Berlin. Felix Mendelssohn. Fourth Symphony, first movement. The musical language of Mendelssohn is a romantic musician dyed classical touches, with a great nostalgic and sentimental component and a strong interest in painting. Notable works throughout his life places him among the leading musicians of the 19th century, with titles such as byte, two quartets op. rope 13 and 12, the Overture and the music of dream of a night of summer, Scottish Symphony and serious variations. In the sacred music of Mendelssohn the influence of Bach, hence appears clearly his works by way of cantatas with large orchestras accompanying the soloists. An example of this influence are the bachianos that can be heard in his oratorio Paulus, especially due to the presence of corals and coral paraphrase. Also in this first oratory of 1836 found some influence of another Baroque musician: G. f. Handel. In his great oratorio Elijah, composed ten years later, the scenes approach also other oratorios haendelianos, and therefore this work was very well received in England, and even served as a model for the composers of 19th-century English. In his symphonies and musical scores as the Overture to a Midsummer night's dream, Mendelssohn uses ideas extra-musical, inspired by nature (the Scottish landscapes), history, or the works of Shakespeare, and does so with great freedom making out of the rigidity of forms. In his orchestral music is closer to the Pastoral Symphony of Beethoven than of other works of this as the heroic Symphony. His work for piano was technology not too virtuosic, even in studies he/she wrote, since it always in his compositions took precedence the serenity and balance. His first works were the Capriccio in f sharp minor op. 5 and the piano Sonata in Mi major Op. 6. in these and other pieces for piano of his youth influences are late sonatas of Beethoven and Karl Maria Friedrich Ernst Von Webermusic, but they also appreciates the sentimentality characteristic of the work of Mendelssohn, which will be shown in all its glory in the songs without words. http://www.classical.net/music/comp.lst/mendelssohn.html; web page about Mendelssohn. It contains label information. In English. 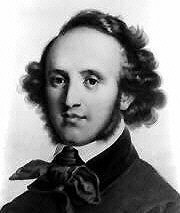 http://www.felixmendelssohn.com; complete website about Mendelssohn. It contains many links, and sound files. In English. http://www.recmusic.org/test/lieder; database containing texts of the lieder of numerous composers (Mendelssohn, Schubert etc.). Songs without words. Performers: Daniel Barenboim (piano). DEUTSCHE GRAMMOPHON 453 061-2. Violin concerto. Cast: Anne-Sophie Mutter, Berlin Philharmonic Orchestra. Director: Herbert von Karajan. DEUTSCHE GRAMMOPHON 400 031-2. Violin concerto. Cast: Jascha Heifetz (violin), Boston Symphony Orchestra. Director: Charles Munch. 617 43 RCA. Piano concertos. Cast: Murray Perahia (piano), Academy of Saint Martin in the Fields. Director: Neville Marriner. SONY 42401. String quartets(integral). Performers: Quartet Melos. DEUTSCHE GRAMMOPHON 415 883-2. String quartets string op. 44 No. 3; op. 81. Performers: Quartet Ysaÿe. DECCA 452 049-2. Elias(Oratory). Cast: Renée Fleming, Bryn Terfel, Orchestra of the Age of Enlightenment, the Edinburgh Festival Chorus. Director: Paul Daniel. DECCA 455 688-2. Lieder. Cast: Barbara Bonney, Geoffrey Parsons (piano). TELDEC 2292 44946-2. Lieder. Performers: Dietrich Fischer-Dieskau, Wolfgang Sawallisch (piano). EMI 764827 2. The dream of a summer night. Performers: Coburn, Remmert, Heilmann, choir, Arnold Schoenberg, European Chamber Orchestra. Director: Nikolaus Harnoncourt. TELDEC 9031-74882-2. Byte. Performers: London musical. VIRGIN VC 545168-2. Paulus Op. 36 performers: Brigitte Balleys, Markus Schaffer, Thomas Hampson, and Rachel Yakar Orchestra and Gulbenkian choir. Director: Michel Corboz. ERATO. Symphony No. 4 "italiano". Performers: Vienna Philharmonic Orchestra. Director: John Elliot Gardiner. DEUTSCHE GRAMMOPHON 459 156-2. Symphony No. 3 "Scottish", Symphony No. 4 "Italian". Performers: Chicago Symphony Orchestra. Director: Sir Georg Solti. DECCA 414 665-2. 5 symphonies and overtures 7. Performers: Hans Peter Blochwitz, Elizabeth Connell, London Symphony Orchestra. Director: Claudio Abbado. DEUTSCHE GRAMMOPHON 471467. EINSTEIN, TO. Music in the romantic era. Madrid, Alianza Editorial, 1986. GELDEN-GOTH, G. Felix Medelssohn: Letters. New York, Pantheon, 1945. GROVE, George; Beethoven, Schubert, Mendelssohn. London, Macmillan, 1951. LONGYEAR, R. M. The music of the 19th century: romanticism. Buenos Aires, Victor Leru, 1971. MERCER-TAYLOR, P. The Life of Mendelssohn. Cambridge, Cambridge University Press, 2000. PLANTINGA, L. Romantic music: a history of musical style in nineteenth-century Europe. Madrid, Akal, 1992.